TresCom Forums • View topic - Drac's Attic: "Escape from Jurassic Park"
Drac's Attic: "Escape from Jurassic Park"
Post subject: Drac's Attic: "Escape from Jurassic Park"
Going to start a series today called "Drac's Attic" which will showcase abandoned modding projects of mine, for the enjoyment they may bring and in case anyone is interested in picking one of them up or using assets. 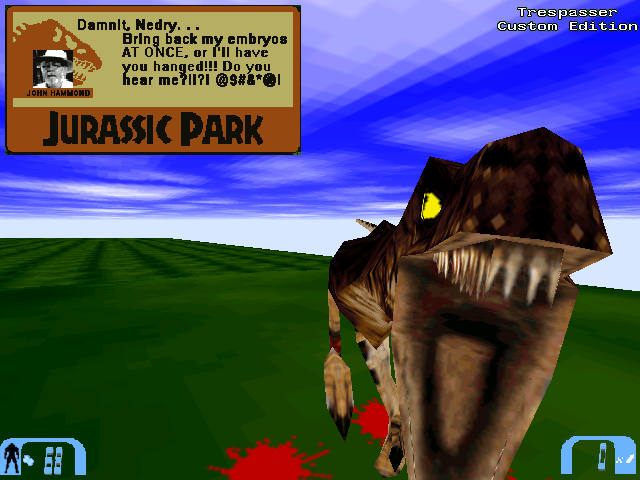 First up is "EFJP," Escape from Jurassic Park, which was to be a mod based on all the old-system JP1 games, including JP Sega, JP: Rampage Edition, JP SNES, and even a wee bit from JP2: The Chaos Continues. The game was to have an emphasis on specially set-up fast paced gameplay, with low-resolution or low-res-mimicking textures, always-face sprites for most game world detail, pop-up text alerts in place of voicoevers a la JP SNES, classic JP game music, and coolest of all, several different playable characters. 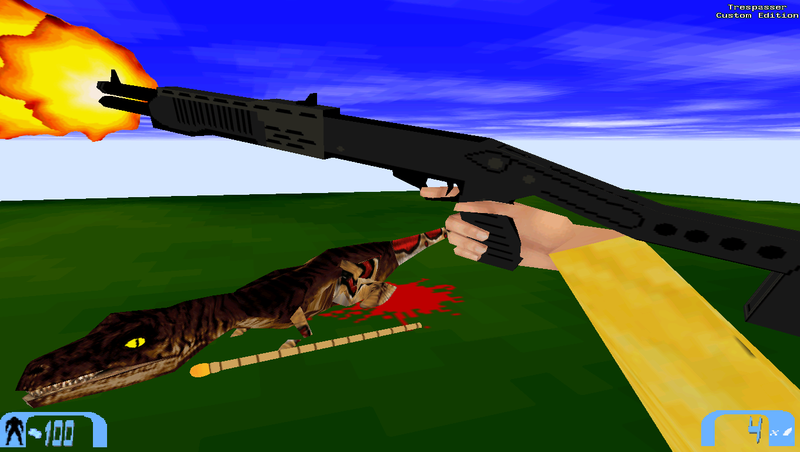 The game may also have implemented a version of my new world hand interaction as seen in that old test level from before. Production of the levels *might* have gone relatively quickly. The game assets would be pretty simple to create and very easily set up in Max and put directly into TresEd, ready to go. The time-taker would be the scripting needed to get the fast-paced gameplay working, as I would have to script several new types of things. Still might not have been difficult but the refining stages to make the game as it's meant to be would take a considerable amount of time, since there were several levels planned to complete the story. Another great thing about the game is that it would be extremely low-taxing on the engine, since everything would be always-lit, textures would be very repetitive, and models would all be very low-poly. It also means draw distance could probably be kept very high. The low-detail environment would also lend itself towards more and better active AIs. Place HelpHmndTest.bmp in the main folder (i.e. "Trespasser Custom Edition/Game data"). And here are all of the note files written about the level, including lists of the needed sprites for several levels and the complete plot outline. After reading the plot, I highly suggest reading the Pages files. Enjoy. If at some point someone wants to take command of this project, I would be happy to assist in the technical details and possibly some artistic assets as well. Post subject: Re: Drac's Attic: "Escape from Jurassic Park"
looks interesting. remindes me of East Dock, and you started this a whlie back, definitly came a long way. I really like the idea of taking ideas from the old Sega games. I can't wait to see how this goes. Interesting... I like the cartoon-like 16-bit look. Most of the JP Game music came from me. I'm like the main 16 and 8 - bit JP video game expert here as well as a video game music ripping expert from games of those time periods. =P I recently just was able to rip the JP NES and JP Gameboy and JP 2: Chaos Continues gameboy soundtracks. I'd rip the Sega Master System/ Game Gear music tracks but they aren't all that good really. So, if anyone wants to start up this project again or a similar one to it and you want music from games of this era, you know where to find me. Jurassic Park Rampage Edition's soundtrack is personally my favorite out of all my rips because of the effort and patience it took to rip it.